WeddingBandsWholesale.com takes great pride in creating expertly set high-quality Diamond Eternity Bands at an incredible value. The eternity band is unrivaled in sophistication and brilliance as a representation of everlasting friendship and love. And because these incredible works of art are so beautiful and unique you can wear them individually or stacked together. 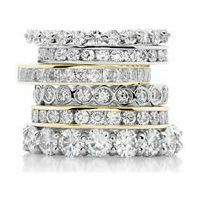 Each diamond that goes into these diamond eternity bands is of the highest quality, and is hand-set by one of our expert diamond setters. These timeless pieces are made of the best products available today, adding to the value and significance of each ring. 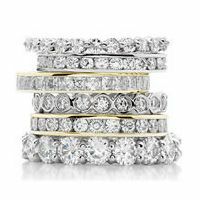 Although they are similar to a wedding band, the eternity ring is relatively new in jewelry fashion. The symbol of eternity is a circle. The eternity ring is intended to symbolize eternal love between two people. Today's diamond etenity bands do that more than adequately. It's impossible not to be dazzled by the brilliance and fire of diamond etenity bands. Using the eternal circle as the basis for creating beautiful rings with full rounds of diamond stones opened the door of opportunity for stone cutters to create diamond eternity rings in a complete circle of emerald, marquis, pear, round, and a variety of other shapes into a circular pattern that is hypnotic, if not irresistable. Yet, diamond eternity rings manage to produce a graceful simplicity that isn't overwhelming despite the number of diamonds in the design. There is always a time and place where an eternity band is an appropriate wardrobe accent. From casual to formal dress, this band is the perfect compliment. Take for instance those with emerald cut diamonds. In a wider width, men love them for formal affairs. In the narrow widths, they create a wonderful feminine appeal women adore. This is a ring that can be given as a gift of love, friendship or for an anniversary. Though eternity rings may be worn as a wedding band, they need not be. Eternity rings can be a cherished reminder of a special relationship or the marking of the anniversary of one. Everyone has a special preference in jewelry. This is just as true for platinum eternity bands. Platinum sets off the fire in diamonds; but it also intensifies the beauty of rubies, emeralds and especially sapphires. One of the newer trends with these rings is a setting with fiery opals, amethysts or smoky topaz. Platinum is a metal that glows under any light yet appears steely and icy. This is why it is such a good basis for eternity bands. They are cool, understated and never diminish in popularity. This type ring offers a lot of possibilities for styles, designs and gemstones. It can be as custom made as your jeweler can create or selected from a designer collection. It just may be that one is never enough with eternity bands. Work out the details of your preferences and then shop online or at your local jeweler. Nothing says “I love you” in a more prominent manner than a diamond eternity wedding band. Set in such a way that every angle is flawless, it perfectly follows the contours of your finger to stand out so that the silhouette leaves you breathless. Eternity bands have long been a enduring tradition in setting a standard for radiating love. Set with diamonds all around the band, an eternity wedding band signifies a commitment to one another in a way that no other ring can. 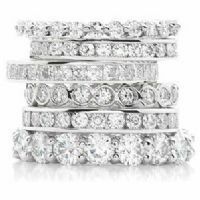 Diamond eternity wedding bands are timeless and therefore should be carefully selected to suit the style and personality of you or your loved one. Diamond eternity wedding rings can be designed with many different modes to reflect taste. They can be worn alongside an engagement ring or can stand alone as a solid reflection of your devotion to your spouse. Many differing styles can be created including a single layer, double layer, or even combining diamond sizes and shapes. Various types of precious metals can be used to formulate the ring including yellow gold, white gold, rose gold, platinum, palladium, or titanium in various karats of your choosing. We use top quality diamonds in creating dazzling rings including GH that can be upgraded to VVS-1, internally flawless, or flawless diamonds. The setting of the ring can reflect a channel setting, box setting, bezel setting, prong setting, bar setting, or pave setting. In the same manner, the diamonds chosen can be selected from a number of different shapes that reflect personality and preference including round brilliant, baguette, emerald cut, princess cut, pear shape, heart shape, marquee, asscher, radiant, or cushion cut. Essentially, the possibilities are endless as are the options for selecting the ideal ring that radiates everlasting love. Wedding Bands Wholesale can customize and create the perfect eternity wedding band for you because every ring that is ordered is built and created in our factory in a custom fashion. This means that no ring is too complex or unattainable. You can let your imagination run wild with thoughts in creating the perfect ring in which we cater to. With the elegance and grace of a unique diamond, so too should be the exceptionality of the eternity band that you select. Ultimately, at Wedding Bands Wholesale, our goal is to create the finest masterpieces for our loyal clients in a manner that does not forfeit excellence for affordability. Customer service and satisfaction is of utmost importance to the Wedding Bands Wholesale team and we look forward to catering your next creation.